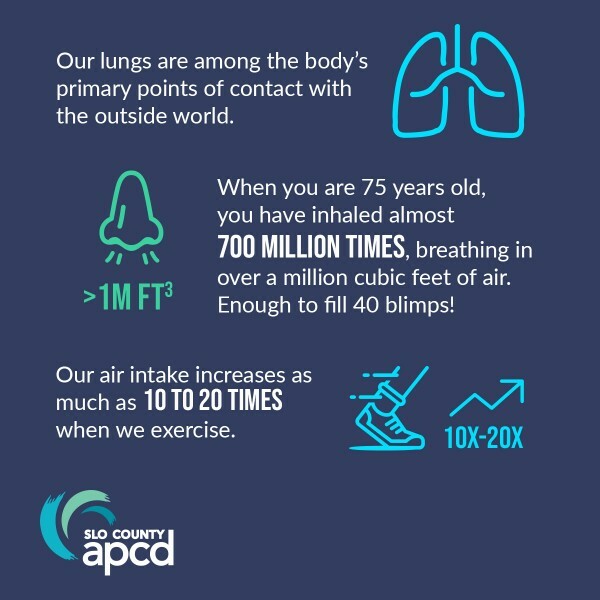 Our lungs are among the body’s primary points of contact with the outside world, so the content of the air we breathe is extremely important. Despite significant success in reducing overall pollution levels at the local and state level, air pollution continues to be an important issue affecting public health. 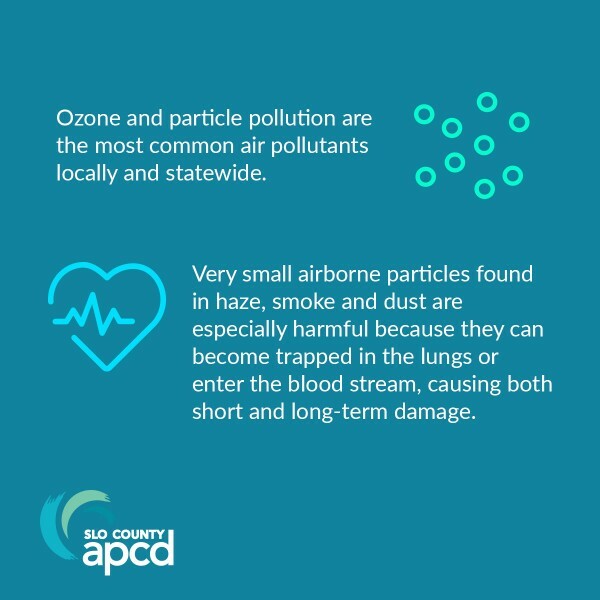 The APCD and SLO County Public Health Department have collaborated on an educational campaign to build awareness and an increased understanding of the connection between air quality and public health. The educational campaign will target local doctors’ offices, medical clinics, hospitals, fitness facilities, public events and agency offices, to provide them with helpful information on air quality and how it could affect your health. Air Quality & Your Health Campaign Presentation, click here. Also, if you would like to request a presentation to be made to your organization please contact Meghan Field at mfield@co.slo.ca.us. Air Quality & Your Health Poster, click here. To request the brochure series to be mailed to you by contacting Meghan Field with the APCD at 805-781-1003 or pick one up at our office. Air pollution can cause or contribute to serious health impacts for people of all ages, including pulmonary, cardiac, vascular, and neurological impairments. Ozone and particulate matter, in particular, have been known to cause irritation to the respiratory system, reduced lung function, damaged cells that line the lungs and even permanent lung damage. Air pollution can also trigger heart attacks, stroke, and irregular heart rhythms, especially in people who are already at risk for these conditions. According to the Air Resources Board, air monitoring shows that over 90 percent of Californians breathe unhealthy levels of one or more air pollutants during some part of the year. 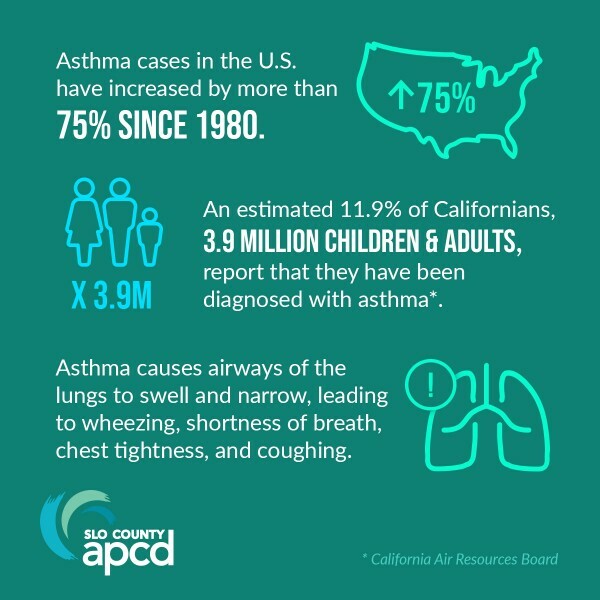 The prevalence of asthma in the U.S. has also increased by more than 75% since 1980, with an estimated 11.9% of Californians—3.9 million children and adults—reporting they have been diagnosed with asthma at some point in their lives; the national average is 10.1%.